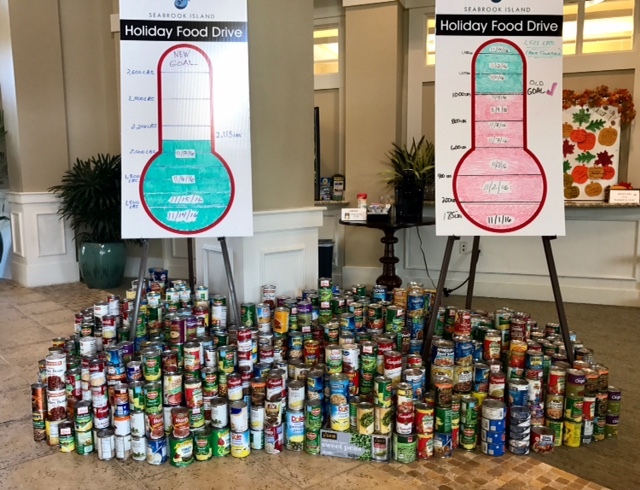 During November of last year, Seabrookers contributed over 5,000 pounds of canned food to our Holiday Food Drive at The Lake House! You probably remember bringing cans to The Lake House and seeing the volume of the donated food grow. Our third Annual Holiday Canned Food Drive will commence on November 1st, 2018. Our goal this year is to donate 7,500 pounds of canned food. Only with your help will we be able to reach this ambitious goal. Please donate canned foods early and often during November. Please help us get off to a great start by donating big right away on Thursday, November 1st. Bring your cans to The Lake House or to the SIPOA Administrative Office and place them under the “NEW DONATIONS” sign. We are collecting canned foods only. Also, please check the expiration dates before donating. All the donated food will be delivered to the Sea Island Hunger Awareness Foundation who will distribute it our neighbors in Johns Island, Wadmalaw and James Island who struggle with hunger. The generosity of Seabrookers make the holidays more enjoyable to many of our less fortunate neighbors. The statistics tell a very sad story. Nearly 4,000 residents of Johns Island and Wadmalaw struggle with hunger. Approximately 90% of the children in Johns Island and Wadmalaw live below the poverty line. Our food drive fills a critical local need. Thank you very much for helping to make the holidays more enjoyable for all our neighbors on the Sea Islands.